Welcome to 443 Blakeney Crescent in Confederation Park, Saskatoon. This home would make a great starter home with “suite” revenue income. Enter the front door to a bright and sunny south facing living room. The living space flows nicely into the open concept kitchen and dining area, and there’s a two-piece bathroom in between. There, you’ll find an abundance of cabinets and a walk-in pantry. The kitchen also features a spacious dining area with garden doors to the deck and out to the landscaped back yard. Outside, you can enjoy your privacy with a fully fenced backyard. There are underground sprinklers. The Double detached and insulated garage allows you to keep your vehicles out of the Saskatchewan weather and provides some extra storage space. Back inside and up the stairs there are three bedrooms and a four-piece bathroom. Downstairs in the basement, you’ll find a separate entrance to the one bedroom basement suite. The landing would usually hold the washer and dryer for the main floor occupants. The suite is bright and open and presents an open kitchen and living area, a four-piece bathroom, and plenty of storage space under the stairs and in the utility room. This home also comes equipped with central vac, air conditioning and underground sprinklers. The owners are sad to leave the neighbourhood - they say they feel very close with their neighbours and the crescent has been very friendly. There are lots of children on the block and they enjoy playing together. 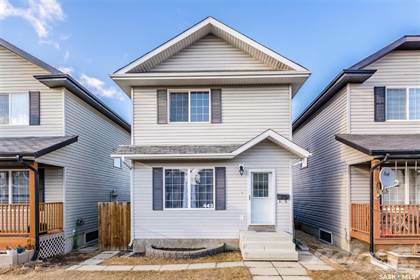 Nearby amenities include the newly developed Kensington shopping centre, Confederation Mall, Blairmore Suburban Center, The Shaw Centre, and two elementary schools. Hi, I'd like to find out more information about 443 Blakeney CRESCENT. Thanks so much!